The Central Dauphin School District is investigating after this social media post showing students posing around a sign that uses a racial slur went viral. A Central Pennsylvania school district has condemned an "offensive" and "racist" social media post from high school students that went viral Wednesday. The Central Dauphin School District said in a statement that it is working to address the facts of the case and determine appropriate disciplinary action. "First and foremost, this type of speech and behavior contradicts the principles and core beliefs of equity, humanity, and dignity that we try to teach our students," the statement said. Many on Facebook and Twitter began circulating an Instagram post that social media users said pictured students from Central Dauphin High School. 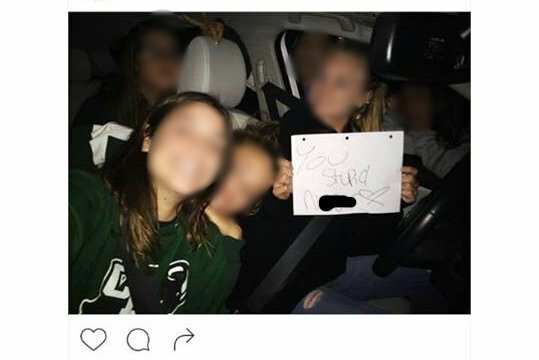 In the picture, one girl in a car is holding a sign that reads, "you stupid n*****," while five other girls pose around her. Several students expressed outrage over the post. Micah Parsons, a junior football player for Central Dauphin who has committed to play at Penn State, said on Facebook that he felt disrespected. According to PennLive, some of the girls allegedly involved have apologized on social media and claimed they weren't aware of the sign when they posed for the picture. "I wasn't in the car, and I was told we were just going to get a picture," wrote one of the girls, according to the website. "I swear I didn't know that they held that paper up. I am not racist towards anyone, and im (sic) friends with people of different races. Never would I mean to offend any of you in any way."